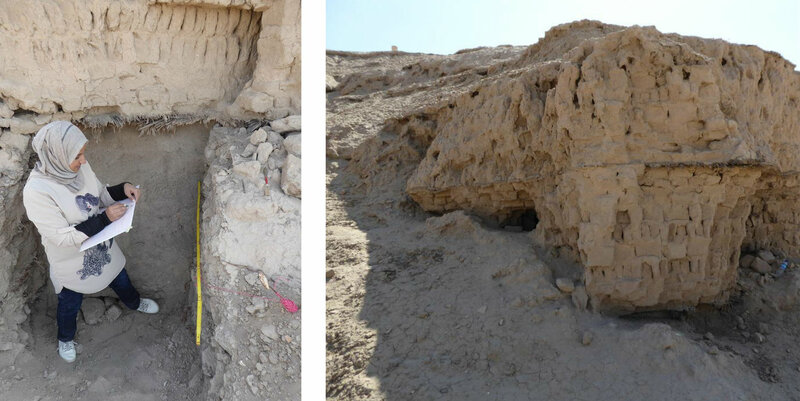 In October 2018 archaeologists undertook conservation work at the Eanna Ziggurat in Uruk (Iraq), funded by the Cultural Preservation Program of the Federal Foreign Office. For over 100 years archaeologists excavated at the Mesopotamian city of Uruk in southern Iraq. The architectural remains date back 5000 years. A part of the ancient city is still visible today. Since 2016 Uruk is a UNESCO World Heritage site. Early on in the history of settlement in the region, buildings have typically been made of unfired clay. Bricks and stones were used less often. Mesopotamian architecture is therefore particularly vulnerable to wind and weather and must be constantly maintained. During the last 15 years, given the many political crises and changes in Iraq, the maintenance of the cultural heritage site was a challenge. All the more urgent are conservation measures in Uruk. The Preservation of Cultural Heritage Program of the Federal Foreign Office provided funding for this purpose. On the top of the Eanna Ziggurat, a monumental clay brick structure, the goddess Ischtar was worshipped. Left: Ancient Mesopotamian city of Uruk with the remainst of the Eanna Ziggurat (©DAI); Right: Visualisation of the Eanna Ziggurat during the 21st century BC (© artefacts). There is a desperate need for action at the western corner of the Eanna ziggurat. The core of its masonry dates back into the 21st century BC and is still very well recognizable. Parts of the brickwork are deteriorating. The researcher therefore defined this corner as a test area for possible preservation procedures to come. At the beginning of October 2018, a German-Iraqi team carried out preparatory work for this purpose. Archaeologists of the German Archaeological Institute examined the architectural remains in small test areas. They wanted to know which conditions had already been documented by researcher in the winter of 1928/29. Left: Before starting the conservation work the demages have to be documented (© van Ess, DAI); Right: The brickwork of the western corner of the Eanna Ziggurat is clearly visible. Erosion is a danger for the clay brick structure and makes conservatory measures necessary (© van Ess, DAI). Not surprisingly, the damages are most severe where overhangs and a deep pit existed already back then. In this area conservation measures must be planned very carefully. The goal is to use fully reversible processes and materials that provide protection and do not adversely affect erosion. At the same time, the archaeologists want to preserve the overall appearance of the building. The team of the German Archaeological Insitute therefore uses modern mud bricks. To ensure an effective integration into the old masonry brick formats common in the 21st century BC are used. The modern clay bricks support the exposed areas and form a protective layer. Left: The team produces 450 clay in Uruk each day to provide the necessary number of bricks for the conservation of the ziggurat (© van Ess, DAI); Right: The clay bricks are traditionally formed in wooden frames and have the same format as bricks dating back to the 21st mill. BC (© van Ess, DAI). Clay bricks take some time to dry completely. After careful analysis of the properties of the old clay bricks, the team produced the necessary number of bricks in the traditional way. The high level of experience of the Iraqi employees in conservation work as well as the German analysis made the following work possible. 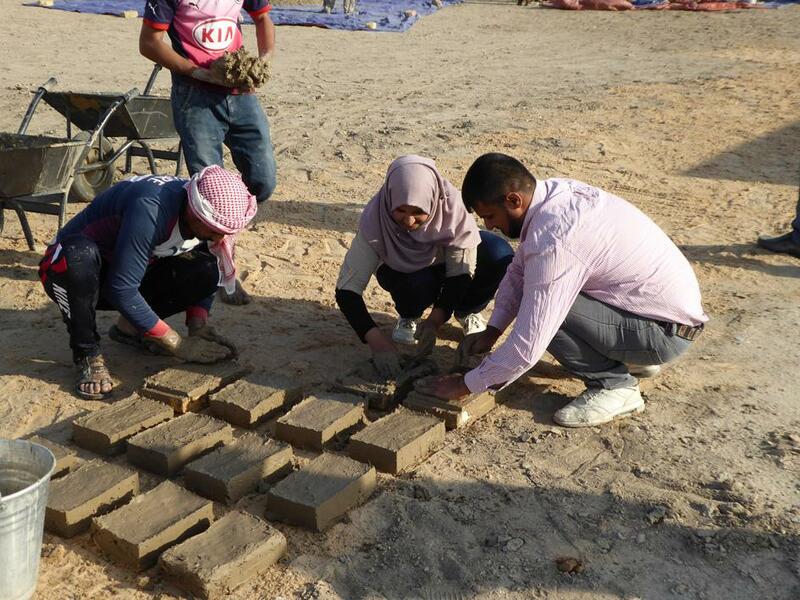 In short time the Iraqi-German team established effective processes and produced matching clay bricks. They now dry in stacks until they will be used on the ziggurat.